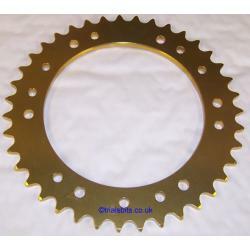 A talon 520 pitch rear sprocket which fits many early twinshock models as follows:- Aprilia 250/325 with Hiro Engine, Aprilia 312, Armstrong models, Beta 240 TR32 and TR34, Fantic 200 240 300 303 305 243 247 307 L-Roo Kee-Roo, SWM 250 and 280. Available with 39, 41, 42, 43 and 44 teeth, please choose your preferred one from the dropdown. For pictures of more sizes, please click the other pictures, these are typical patterns which may vary slightly. To check your fitment, the inner cutout has a diameter of 135mm, and the drillings are 160mm centre to centre.